Creamy-white leaves of good substance surrounded by a dark green margin. A sport of 'Champagne Toast' that has all the characteristics of a tetraploid. Satin-green leaves with a wide wavy white margin. Dark green, shiny leaves held on intens red petioles. Large, intense blue leaves that are rounded and corrugated. The rippled margin makes it a stunning new Hosta. ‘Niagara Fall’, ‘Neptune’, ‘Fulda’ and rupifraga are involved in this complex hybrid. 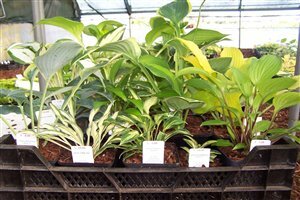 Plants we offer are still smallish! Bright yellow leaves in spring with a dark-green rippled margin. Probably looks a lot like 'Amalia' which is also a sport of 'Dancing Queen'. Upright, blue-green, wavy leaves held on red petioles. So far the largest “red” of hybridizer Rick Goodenough who tells it is very fertile. A must have for hybridizers to do some “crossings” with this one. Blue-grey leaves with a wavy margin on purple petioles. Wavy golden leaves, The all-yellow sport of 'Hawaiian Luau'. Narrow and thick, upright yellow leaves with a heavily rippled blue margin. An interesting sport of ‘Ripple Effect’. Powdery-blue leaves with a yellow border. Arching green leaves with a narrow white wavy margin. A collection of three plants consisting 'Hawaiian Luau' and its sports 'Golden Hawaiian Luau' and ''pring Luau'. Very thick and shiny dark-green leaves with a yellow margin. The tetraploid sport of ‘Secret Treasure’. Grey-green leaves with red petioles. A sport of 'Red Cloud'. Upright green leaves with a thin white margin. Sport of 'Praying Hands' but with a white edge. Round, green leaves. Nice new little Hosta with 'Blue Mouse Ears' in its genes.